I’m only ten months old Golden and my family decided they could no longer take care of me. I lived in Puerto Rico and was relinquished to a rescue group called Love Puerto Rico Goldens. 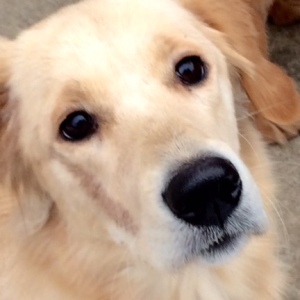 Those nice people told me that there were lots of wonderful families only a plane ride away waiting to meet a sweet golden like me through an organization called As Good as Gold Golden Retriever Rescue. Before I knew it, I had my ticket to ride and was on my way! Even though I came from the tropics, it didn’t take me long to learn to love the cold north winds of Chicago. What could be more fun than making snow angels, frolicking in the white stuff and eating snow balls? I wasn’t sure about the ice between my toes though! I have lots of energy and have no trouble keeping up with my foster mom on her long jogs each day. I stay right next to her the whole way and could run forever. I also enjoy going on slower strolls walking three abreast with my foster siblings Lulu and Bolt. Foster mom says I’m a DREAM on a leash. I love meeting other dogs along the way and am gentle with the neighborhood children who come over to pet me and give me hugs. My favorite game of all is to take my stuffies out of the toy box, throw them into the air and catch them. I also like to put them into the wet shower after foster mom gets out! After a full day of playing and wrestling with Bolt, I have no trouble settling down for some ear scratches, tummy rubs, cuddles and a bedtime treat. My foster mom brags to everyone that I am very well behaved for a puppy less than a year old! If you are looking for an active companion whose foster mom calls her “Doll Face”, look no further! I’m the gal for you!